French trains are some of the fastest and most comfortable you will ever travel in. 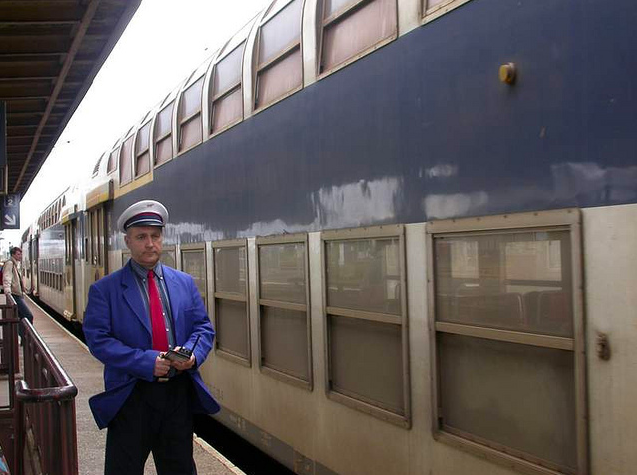 Some routes use double-decker trains and they certainly put British trains to shame. In many countries once you have bought a ticket you can sit back and relax, but in France they have a sneaky extra step that the traveller needs to complete. 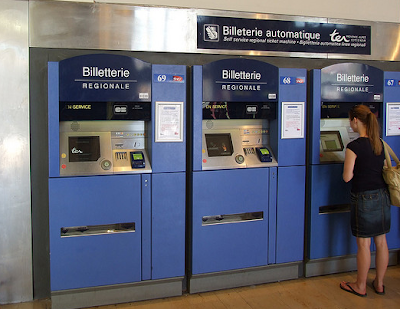 French stations are full of ticket machines, so as long as you recognise the words, you can buy your ticket without generating a huge queue and embarrassing yourself at the ticket office. Once you have bought your ticket (billet) you need to validate it at one of the machines before you go to the platform. 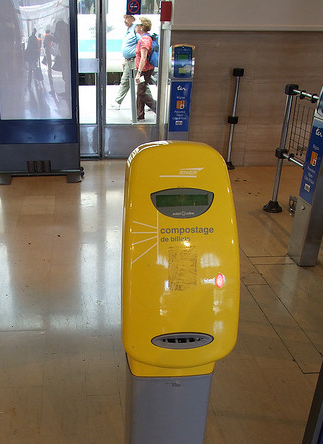 The ‘compostage’ machines are often yellow and prominently placed either side of the walkway from the ticket hall to the platforms. You introduce one end of your ticket and the machine stamps it and then spits it back out at you. They stamp the date and time onto your ticket. This is an important step as without having the ticket stamped you could potentially re-use it, which obviously the French train industry would take a dim view of. So although there are rarely barriers at French train stations, it is not worth trying your luck on this. Onboard ticket inspections are frequent. Something else worth mentioning is that there are not often food kiosks on platforms, so if you are travelling hungry grab something on your way to the station. Lastly, a word about strikes. Generally French trains are a very efficient and comfortable way to travel around France but a very common problem with French trains is strike action. France’s transport network is often crippled by strikes so it is worth checking the service before you travel. Have you used the French rail network? How did you find it?